After his victory, Oscar De La Hoya feels he is someone to be reckoned with! Oscar De La Hoya was impressive enough in his debut at 154 pounds. He won a title, thrilled the crowd and had enough left in the end to put Javier Castillejo on the canvas in the final round. More importantly, though, he put himself back in the mix for some fights he really wants. All in all, not too bad for a night of work. "I set the terms now," De La Hoya said. "I want to fight the best to be the best." De La Hoya didn't see the best Saturday night against Castillejo, who was game enough but not talented enough to keep the WBC super welterweight belt he wore into the ring against De La Hoya. The result was a lopsided decision that made De La Hoya a champion for the first time in nearly two years, and hopefully set himself up for rematches with Felix Trinidad and Shane Mosley or a fight with Fernando Vargas. "It doesn't matter which one. Whoever's available," De La Hoya said. De La Hoya's move up to 154 pounds was a successful one as he dominated an outclassed Castillejo to win his fifth title in as many weight classes. De La Hoya went into the fight an overwhelming favorite of both the fans and the oddsmakers despite being the challenger, and didn't disappoint either one in a performance that even left Castillejo impressed. "I've seen quick and fast boxers, but he's extremely fast," Castillejo said. "He's an outstanding boxer and a great champion." 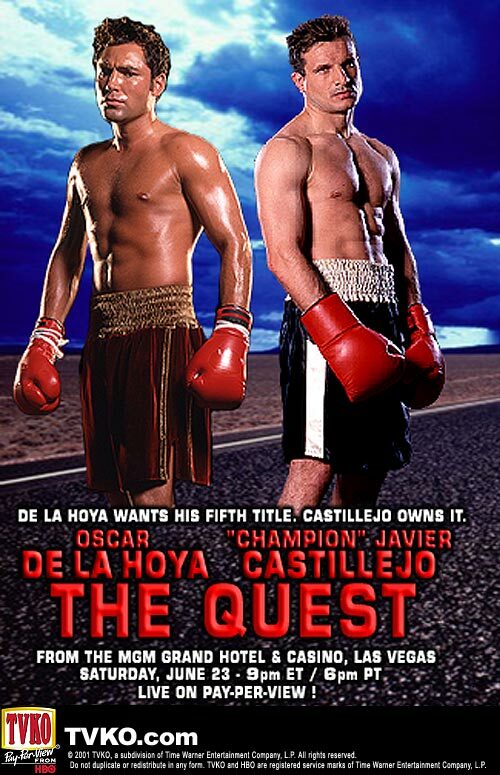 De La Hoya won 11 of 12 rounds on all three ringside scorecards -- losing only the 10th when Castillejo rallied to score with some head shots -- and finally dropped the champion with five seconds left in the 12th round. De La Hoya smiled as Castillejo went down and the crowd at the MGM Grand hotel arena erupted in a frenzy. The champion, bleeding from a cut on his left eye, got up quickly and the bell sounded to end the fight before action resumed. "Some people don't think I have power or stamina, but I do," De La Hoya said. All three judges scored the fight 119-108, giving Castillejo only one round. The Associated Press also had De La Hoya winning by the same score. De La Hoya, fighting for only the second time since his defeat against Mosley last June, had vowed to quit if he lost to the 33-year-old Castillejo, who had rarely fought out of his native Spain. Instead, he set himself up for possible rematches with Mosley and Trinidad, the two fighters who have defeated him. Castillejo had made five successful defenses of the 154-pound title, but he was tentative and spent much of the early part of fight backing up against De La Hoya, who landed effectively to the body and head with his left hook. Castillejo (51-5) fought only in spurts, though he began pressing the attack in the late rounds, only to take a beating from De La Hoya's left hook. Still, he never went down until a left hook caught him in his corner in the final seconds. "I think I earned the respect of the people," Castillejo said. De La Hoya (34-2) was an 8-1 favorite by fight time, and by the middle rounds the only question was whether he had enough power at 154 pounds to stop Castillejo. He rocked the champion in the early seconds of the opening round with a right hand and shook Castillejo all night with the left hook. But he never really had Castillejo in trouble and never seemed close to putting him down until the final round. De La Hoya earned $3 million for the fight, to $800,000 for Castillejo, who was fighting in the United States for the first time. Both fighters weighed the class limit of 154 pounds.